Sketch and add background wash. 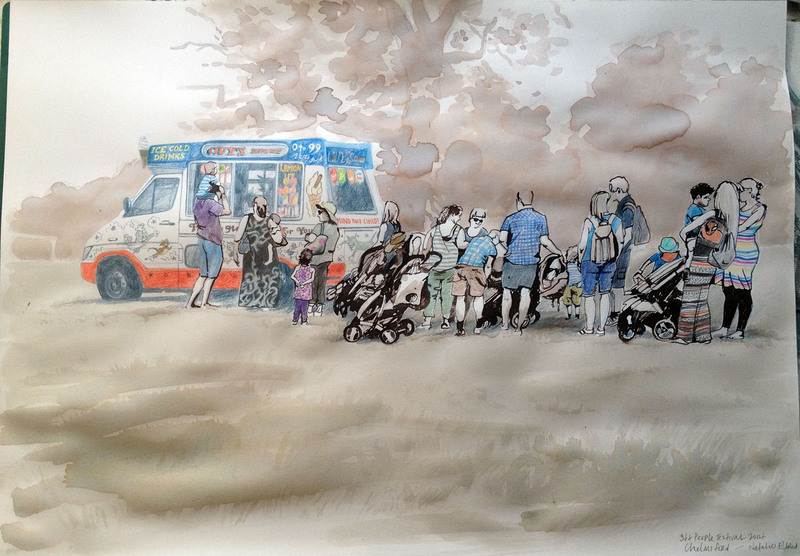 Draw the ice-cream van – I like all the lettering and folk-art like decoration. I’ve avoided outline where possible. Darken the trees by adding a second wash over the first. Add some tone to the figures. Draw the figures, trying to avoid drawing too much outline (think it may be too dark). Add colour and detail to the figures – here I am more interested in pattern than conveying realistic tones. Use the same ink wash, tinted, for the ground. OK, so what has this to do with the Winnicot quote? And is it relevant? This post is about two things really, and I am not certain if they are linked. Firstly – the 3ft People Festival, such a lovely wee affair, full of parents trying to make their toddlers appreciate this great feast of music and crafts, colourful tents, banners, balloons and the like; with toddlers protesting and getting grouchy and hungry and having fun, exactly the same as they usually do. Well, it hit me that it’s be a good place to draw. A priority in this plan was to drum up ‘interest’ in what I am doing, but also to get a greater variety of events on my new event illustration website. I requested permission from the council that I be allowed to draw there because following kiddies around, staring and scribbling in a sketchbook might get me in trouble otherwise. So come Tuesday the 24th June, off I went, alone, with conspicuous artist accoutrements (large drawing board & bag of materials). And I was consumed by well, what was I consumed by? Embarrassment, fear? I didn’t want to just set up in the middle of things, everyone will be looking at me. They will be expecting me to be a genius! (I am not comfortable in the spotlight). 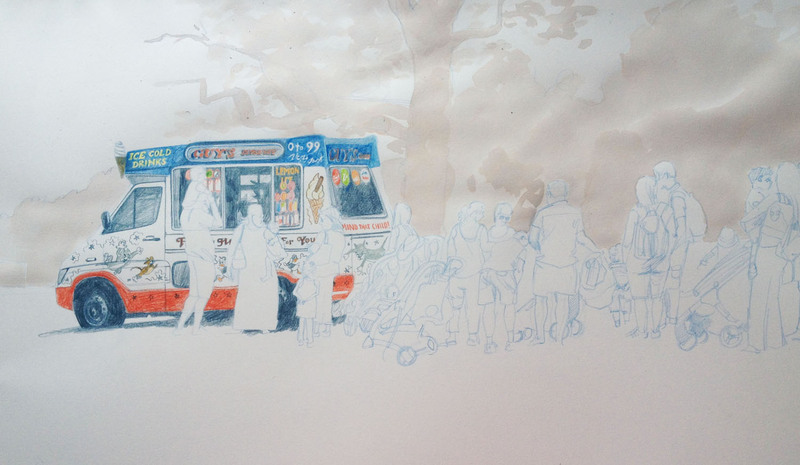 I am so endlessly fascinated by people that I really do think I could draw them all day, but hiding in the background at festivals it becomes impossibly difficult to draw. Firstly, and perhaps surprisingly, people moving is not such a huge problem, the far bigger problem who will stand in front of what you are drawing. Sometimes people who are perfectly well aware of you drawing, will do that too. Due to the laws of perspective, they only have to be a little nearer to you than the subject – and hey, you can’t see a thing. By the time they’ve moved on, very often your subject has too. And that’s where the quote comes in – a part of me wants to be flamboyant, bolshey; confidently getting families and kiddies to sit in front of me whilst I draw them, asking others to move the hell out of the way, whilst another part just wants to hide away and draw in peace. And with the devil accompanying me on my shoulder, whispering in my ear “You are not actually really any good at this are you?”; “You do know you will have to GET A PROPER JOB, dont you?” and “There are a million people better than you! What do you call that! !” etc etc…. it is hard to do, very bloody hard to do. So, there you are, something of the tension between hiding and communicating? I’m not sure it ‘drives’ me, but it is certainly there and it is certainly tense. And we come to the second point. 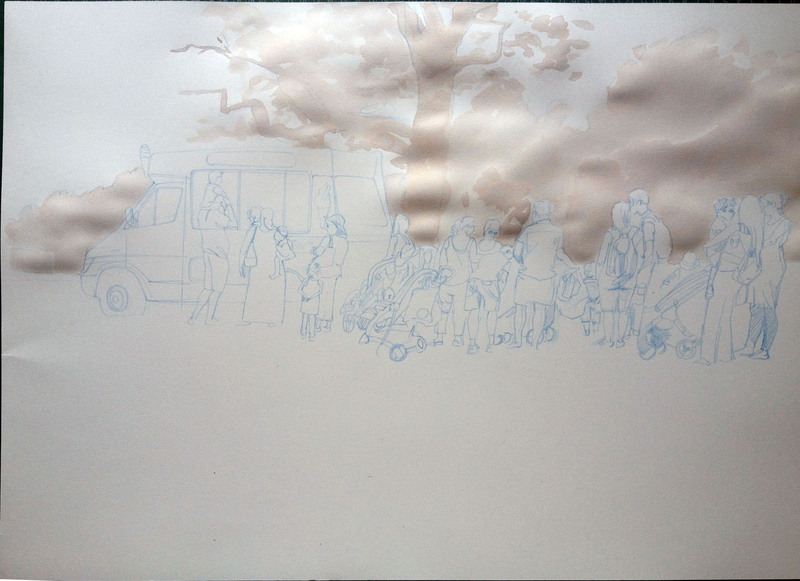 The reason I have photographed various stages of this drawing is because I am pleased with the way that I ‘planned’ it. I feel it is a step closer to the way that I need to work as an illustrator, rather than as a ‘Fine Artist’, (note that there is another blog post to come about fine art, my own art training, British art schools generally and what you might call ‘classical art training’). I have come to see that previously (my reference to being a ‘fine artist’) I sort of drew and saw where it took me. Sometimes the drawing came out OK and sometimes it didn’t. 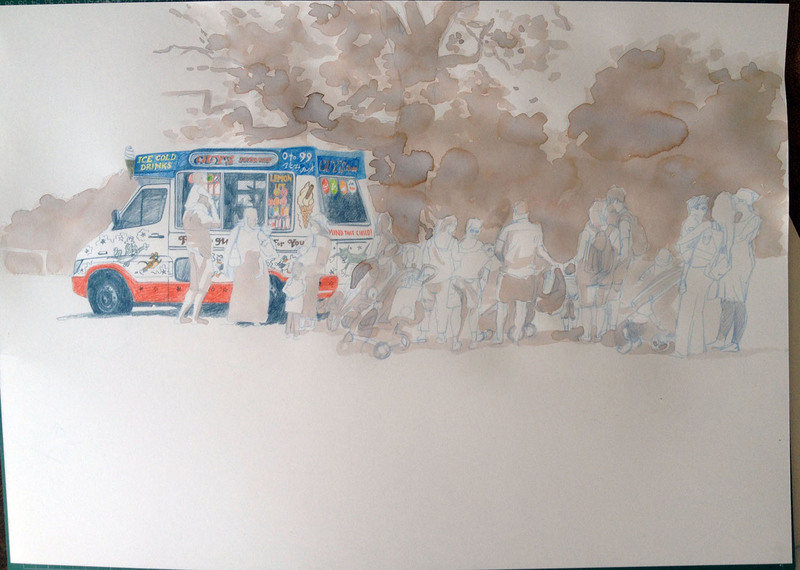 This is about drawing with a method – having ‘a plan’, thinking about what I want to emphasise in the drawing. 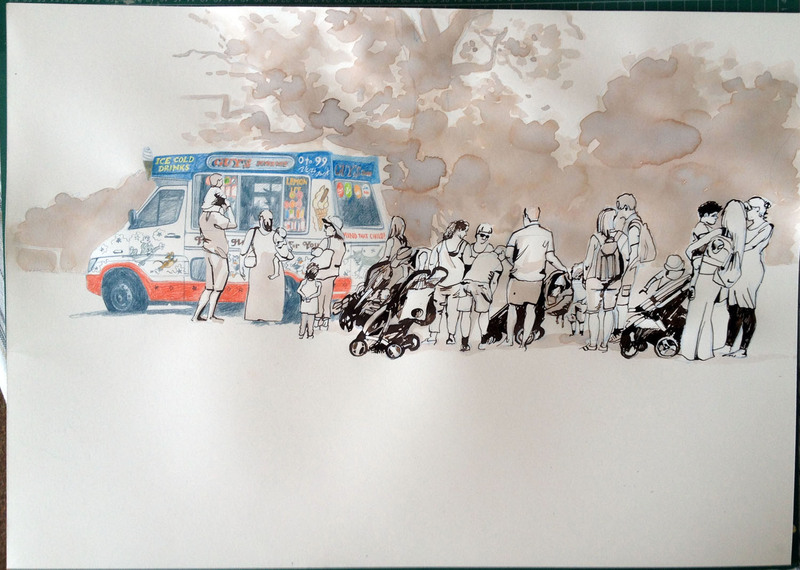 So here, for example, I wanted to emphasise the ice-cream van’s low-culture/folk-art feel and the queue of figures. It is an essential skill for an illustrator. The drawing, to be an illustration, needs to say something other than simply ‘this was here’. 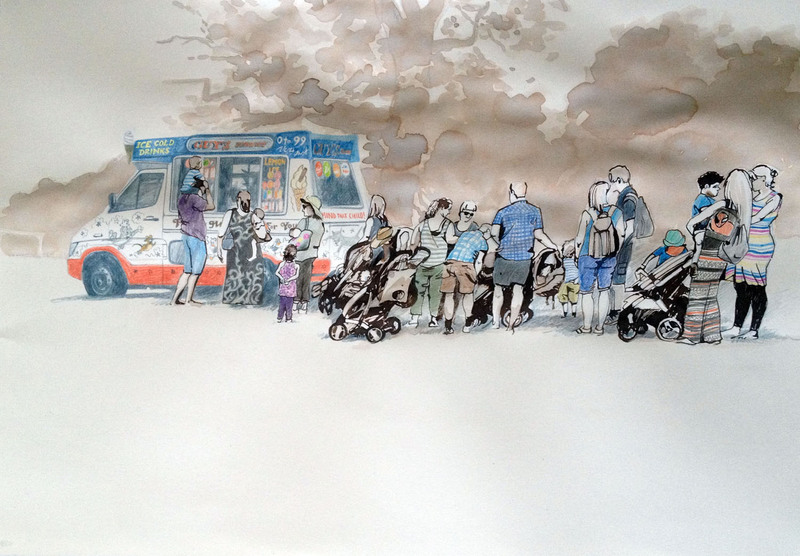 Hopefully this drawing says something about parenting (carrying children, bags, queuing for ice-cream) and something about ice-cream vans (curiously modern and old-fashioned, highly decorated, something ‘gipsy- fun fairish’ about them). So I’m not just randomly and haphazardly ‘drawing stuff’ with no control over how it will turn out. This is one of the key differences, I think, between art and illustration. I am going to say so here and now that illustration is much harder than fine art!! The link between that point and the hiding/communicating thing? I hold on to the belief that if I find a ‘way’ (a magic formula) to work/draw, that is reliable (talking purely technique here), then I may just be able to be a bit more bolshey, to sit in the spotlight – and go tell the devil to take a hike. Then again – it probably won’t make the slightest difference because, after all, you just have to get out there and get doing it. I can’t be hanging around waiting for a magic formula… now there’s a story there! Thank you! I thought it was a bit random – a friend sent me the Winnicot quote, well ‘tweeted’ it, and it really made sense in connection with trying to draw at the festival. I hope to post the drawings here soon. Hello Dapplegrey … I am so going to read that post! Yes I know what you mean, and I very much doubt I’d get sick of your comments. It’s great to have the ‘conversation’. There was something else you told me about your drawing a crane and loads of people (I think on the other post) – I want to see that drawing! Sounds immense – both brave and challenging. It’s the struggle of looking and capturing that makes a drawing vibrant and interesting… whether from the imagination, or from life.